"Follow me! I entrust the future to you!" ACT (VC) Legion 21000 "King of Knights, Alfred"
ACT (VC) [Soul Blast 2 Cards. and choose 1 card in your hand that has the same card name as a Unit in your Vanguard Circle, discard it] If this Unit is in "Legion", call to separate Rearguard Circles 1 Grade 2, 1 Grade 1 and 1 Grade 0 Unit, then shuffle that Deck. CONT (VC) If this Unit is in "Legion", your other Units cannot Boost this Unit. Today's card we're introducing Alfred's father, "Vanguard of the King of Knights, Alfred"! He can now fight in the form of his youth, and Legion with the proudhearted King "King of Knights, Alfred" as father and son, to fight with the current Royal Paladins!! Along with Alfred's ability, these cards can Legion Attack with a total of 31000 Power! They may not be able to be boosted, but these two can attack with more power than a normal Vanguard, and are likely to become the core of a new kind of "Royal Paladin" Deck with their offensive Power!! Ezer's Legion Skill lets you bring out 3 Rearguards in an instant! Along with the Activate ability of "Alfred", you can combine both abilities, you can instantly! You'll be able to bring out whatever formation you desire. 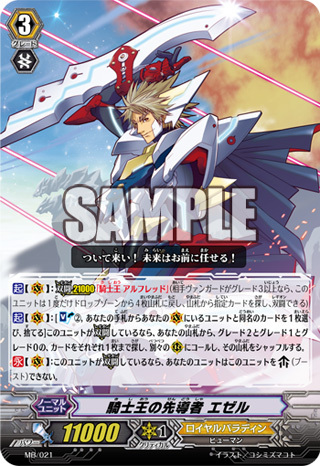 "Vanguard of the King of Knights, Ezer" is the 3rd Revival Grade 3 Campaign card which comes in the September issue of Monthly Bushiroad and the September issue of Bushiroad! Since this card is distributed at official stores starting September 1st, 2014, check out your local stores from now on!! Activates the whole deck for a tiny cost. It's about time Bushi gave us actual Royals back. The art leaves a lot to be desired imo, otherwise looks fun. Illyarcher wrote: The art leaves a lot to be desired imo, otherwise looks fun. I like his smug face though.